The Samsung Galaxy Note 8 is a big phone, but its battery is rather small at 3,300mAh. However, the Samsung Galaxy Note 9 could massively improve things in that area, as it’s rumored to have a 4,000mAh battery. That claim comes from leaker Ice universe, who has a reasonable track record and claims to be “100% sure” of the size. They might be sure, but as far as we’re concerned nothing is guaranteed for now, so take this with a pinch of salt. That said, it's a believable claim, as 4,000mAh isn’t out of the question for a phone, especially one rumored to have a 6.3 or 6.4-inch screen. In fact, it’s a claim we’ve heard before, though not all sources agree, with an earlier leak pointing to a still-large 3,850mAh battery. One thing that all sources so far seem to agree on though is that the battery will be getting bigger by some amount, which can only be a good thing. All in all, the Samsung Galaxy Note 9 is shaping up to be a decent flagship, with other rumors pointing to a Snapdragon 845 chipset, 6GB or 8GB of RAM and potentially even an in-screen fingerprint scanner. 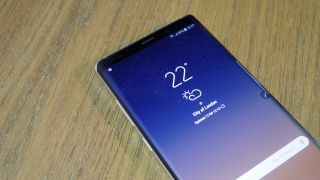 We wouldn’t count on getting all that, but if we do then the Galaxy Note 9’s launch – likely in August – could be worth the wait.